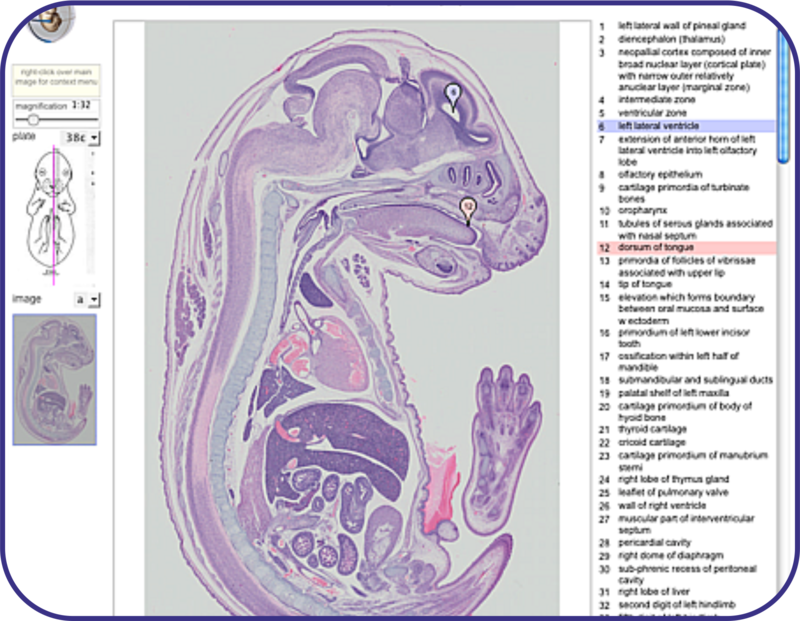 This eHistology Kaufman Annotation resource is dedicated to the memory of Professor Mathew Kaufman whose pioneering work and vision contributed to the development of the eMouseAtlas conceptual framework, and his deep knowledge and understanding of developmental anatomy provided the timeless and unsurpassed "Atlas of Mouse Development". 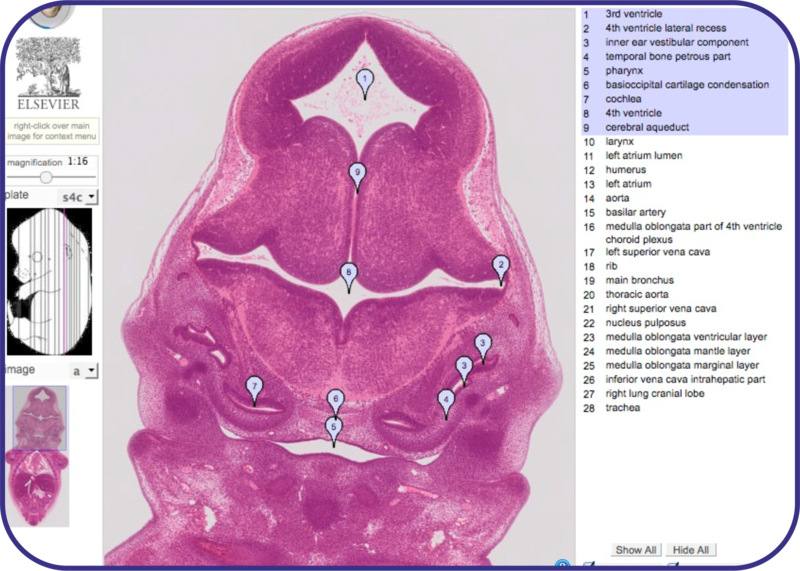 eHistology is now extended to include the new annotated coronal sections captured and annotated for the "Atlas of Mouse Development Supplement with new Coronal Sections" that is now available and is an extension of the original atlas. These images have been annotated by Professor David Price and Dr Chris Armit at the the University of Edinburgh plus terms noted by Professor Kaufman before he died. The resource is the result of a collaboration between the eMouseAtlas group and Academic Press / Elsevier Inc. and the new image data provided from this resource will be linked to licensed material from the original publication. 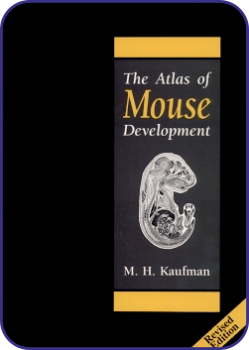 The original paper publication of "The Atlas of Mouse Development" by M.H.Kaufman (1992, Academic Press, London) is the definitive work for mouse developmental anatomy. The original figures were generated from black and white photographs of the H&E stained sections painstakingly annotated by hand by Professor Kaufman. Here we have re-digitised, in high-resolution and colour, the original histology sections on glass slides and now make the new set of images freely available with a zoom-viewer. In collaboration with Elsevier these new images show the annotation from the original paper atlas and are linked through to other mouse resources such as the eMouseAtlas and MGI/GXD. The full book content is likely to be made available via online material and an eBook from Elsevier using these images and annotations. Note: all images and associated metadata are available for free download and can be used for any purpose provided appropriate citation is made. 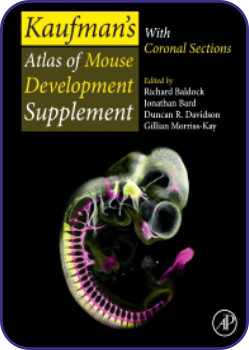 A supplement to the original Atlas of Mouse Development has been published and the coronal histology images of the original have been extended to more stages and presented online as full sections through the embryo. The annotations from the book are presented in the same way as labels with markers in the zoomable image. 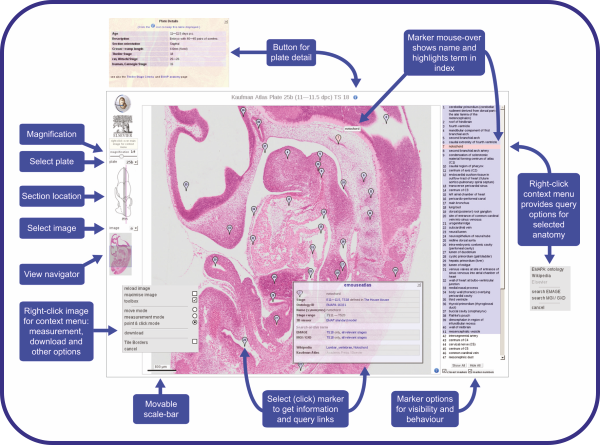 The online view of each image can be found using the eHistology interactive image index. Selecting the plate from the film-strip at the top presents a view of all the section images available for that embryo. Details of the stage and and approximate location of the section within the embryo are provided in the central panel using a composition from the original diagrams in the book. In due course this index page will include a search option, allowing users to search for particular terms within the resource. This will also allow the section date here to be linked through from other parts of the eMouseAtlas resource including the 3D models, anatomy ontology and gene-expression database. Context menu for database queries, Wikipedia links, download options and other display modes.